Hi, I’m Ziggy and I love to eat. From street food to Michelin star-rated restaurants, I love them all. My love affair with food began early on in former Soviet Moldova, where I vividly remember standing in long lines with my dad for the most delicious bread. Coincidentally, my love affair with ice cream began the same way. Same goes for toilet paper. National Geographic recently ranked the Moldovan people to be the saddest people in the world. Coincidentally the happiest people ranked were ex-Moldovans. I’m a father of two, husband of one, and at the moment pet owner of none. Our last goldfish. Ziggy Jr. Jr., leaped to his death. This is likely due to the great suffering he endured once my kids discovered Full House and watched it night and day in the same room. 1) Never go to the same place more than once (unless I’m in Turks and Caicos). 2) Never eat at my hotel (or any hotel, pretty much). 3) Eat only in places where I can easily distinguish the men’s room from the women’s. Is that a hen or a rooster? I’m on vacation, leave me alone. 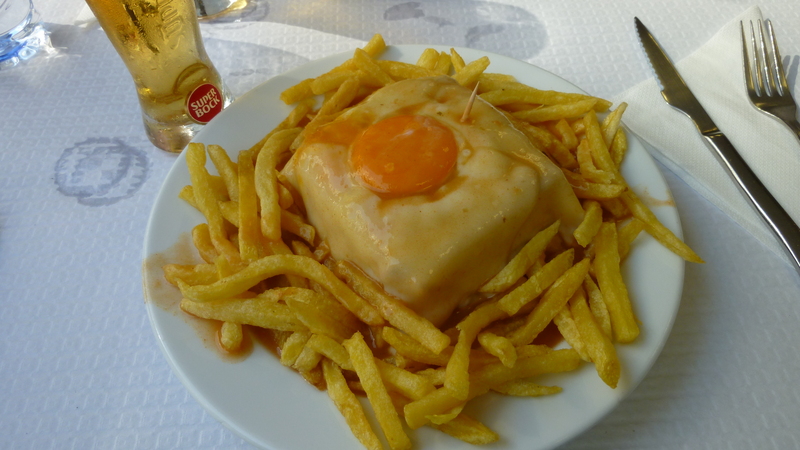 It is a sandwich made with ham, 2 types of sausage, steak and served with melted cheese and some secret beer-base sauce. You can order it with egg or not. 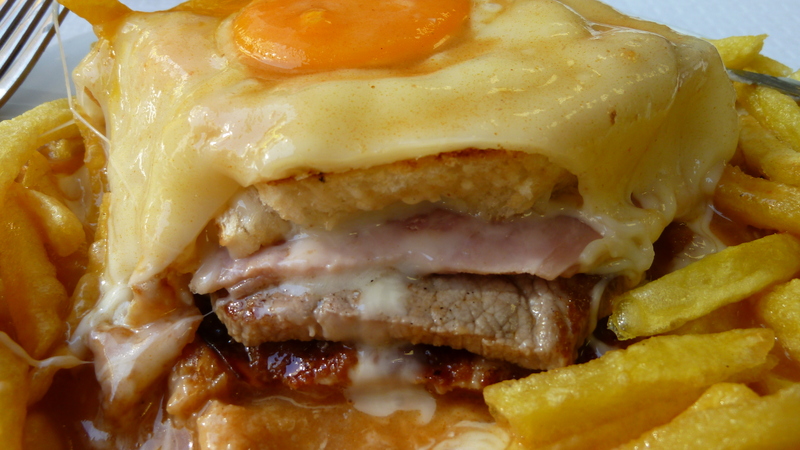 It was created by a Frenchman trying to adopt the Croque-monsieur in Portugal, hence the egg and ham. But it’s all about the sauce, which you can barely see here (it’s the yellow stuff – click on the picture to get a closer look) with each restaurant trying to outgun the rest with their homemade sauce. Perhaps the greatest sandwich I’ve ever eaten. Anyway, so you get the idea. A blog about food, travel, goldfish, and FOOD. I give it 3 months!! I only eat what Ziggy recommends, nothing else. love this “about” page…totally honest…I will now begin exploring further. Thanks for liking my recent post on my India Journal. I write alot about food as well during my travels,,,,you can check out past post from other years of sojourns in India…and look forward to hearing about your “eating” in Israel…my home for the past 40 years. Between Indian and Israeli eating, I never get tired of talking about food, and of course eating it! 🙂 Yes…I like to use smilies also. I’m so glad I found this. We’re coming to NYC again and I will follow your recs. 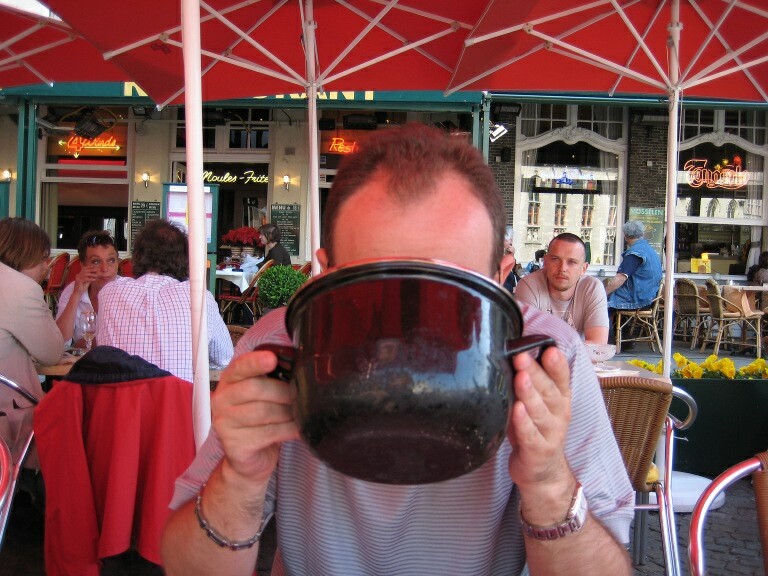 Great blog… now I am officially ravenous for more! Hey Ziggy- Great write-ups with so much humor as well. You had me laughing many times. How do you stay so slim? Must be all that NYC walking….look forward to more! Ziggy….love, love, love this blog! Leaving for Provo on Saturday and can’t wait to try some of the places you recommended. Love your three rules of travel! Loved Siena!! Did you see my 2 posts about your lovely city..
Nice to virtually meet you! I had just sent you a message over TripAdvisor before realizing you had a blog of your own! if you’re interested in collaborating on some joint posts that discuss the awesome link between travel and food, then let me know! always open to new ideas! Great Stuff but how do you know Mike Tyson’s favorite Russian food is Pelmeni? Do you still do these? Would be interested. Hi there! Absolutely love your blog (your writing is so entertaining, not to mention the photos make me hungry)! I was hoping I could get in touch with you via email, could you let me know how to reach you? Do you give Hell’s Kitchen food tours? Can we make a Friday night curtain? There are 2 of us and it’s Friday 8/8. Are you available? Hi Ziggy, Can you accommodate a non-meat eater on your HK tour? Staying for a week in Tuscany and have noted your recommendations. Any advice on Venice? We end our trip there. I’m looking for a great place to celebrate my husband’s birthday. By the way, we are Turks and Caicos lovers as well!!!! Thanks for the tips! I am enjoying the planning process, always do! I should have followed advice # 1 instead of going to the great French provincial restaurants between six and, in one case, about 50 times over 30 years. Then I wouldn’t know how Chapel,Guerard, Bras, the Troisgros, Girardet, etc. etc. etc. evolved and kept coming up with one sensational dish after the other. My husband found your blog before our trip to Italy. Because of your suggestion we ended up eating the Pollo al Burro at Sostanza in Florence and just about every dish we could at Le Mani in Pasta in Rome. Heading to NYC in March so reading up on your recommendation! If you haven’t tried the doner kabob in Berlin at Mustafas then you need to be aware that your “greatest sandwich” title has not been tested against the best.